Portable air conditioners (AC) have many benefits. They’re cheap, space efficient and convenient, there’s no installation required, and can be easily moved from room to room. But portable air conditioners do have a very large downside: they produce very much noise when running. Most portable AC units on the market are very noisy, even when they are running at the lowest fan speed. Most are in the 60 – 70 dB range, which is analogous to a conversation in a crowded restaurant to a portable generator. You most likely won’t care about this until you realize that you can’t sleep at night because there is a noisy portable air conditioner is running next to you. So, rather than looking at models that have a sleek design or come with other unnecessary premium features, we’d suggest you buy the quietest portable air conditioner possible that you could find. And of course, it must have enough capacity to cool your room. 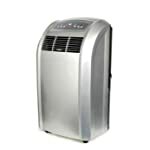 Most portable air conditioners list decibel rating of the system at each fan speed. You can find the quietest one by comparing these rating each other. Some manufacturers do not release dB ratings of their models but remember that if a manufacturer has put effort into making their AC units quieter, they would want to mention that in their marketing materials. In this article, we’ve listed the actual decibel ratings of some of the quietest portable AC units available on the market. We also give you reviews written by our experts that may help you find the best quiet portable air conditioner that is suited to your need and budget. But ultimately one of your best sources for knowing what to expect from the noise of a portable air conditioner is to read customer’s reviews on Amazon.com. Many of them mentioned about it after they experienced. At only 51.5 dB, the Whynter Dual-Hose ARC-122DS Elite is the quietest portable air conditioner we’ve found. Not only is it as quiet as a window AC unit, it cools a room much faster than other portable air conditioners of the same capacity, using the least energy, even in extreme heat. It’s also significantly smaller and lighter than its closest competitors, so you can move it from room to room with ease. If our main pick is sold out, the Emerson Quiet Kool EAPC14RD1 is a great alternative that comes with a great warranty. It has a strong compressor which cools the room down very quickly. This unit is the loudest portable AC in the list, but it’s still quieter than most other 14,000 BTU units. Its sound seems to be very tolerable. Many users supposed that a little white noise from this portable AC was actually making them sleep better. Noise levels are measured in decibels and unless you are really familiar with the metric system, decibels can be very hard to understand. The decibel (abbreviated dB) is the unit used to measure the intensity of a sound. The decibel scale is a little odd because the human ear is incredibly sensitive. Your ears can hear everything from your fingertip brushing lightly over your skin to a loud jet engine. On the decibel scale, the smallest audible sound is 0 dB. And 0 dB is also the quietest sound audible to a healthy human ear. The relative loudness that we perceive is a subjective psychological phenomenon, not something that can be objectively measured. Most of us perceive one sound to be twice as loud as another one when they are about 10 dB apart. For instance, a 60-dB portable AC unit will sound twice as loud as a 50-dB portable AC unit. Yet that 10-dB difference represents a tenfold increase in intensity. A 70-dB portable AC unit will sound about four times as loud as a 50-dB unit, but in terms of acoustic intensity, the sound it makes is 100 times as powerful. A 50 dB portable AC unit will sound pretty the same a 51 dB portable AC unit, yet 1 dB change in a sound equates to about a 26% difference in sound intensity. A 3 dB difference is a doubling of intensity levels. In terms of subjective loudness, a 1 dB change yields just over a 7% change. A 3 dB change yields a 100% increase in sound intensity and just over a 23% increase in loudness. These days most cheap portable air conditioners have normal decibel levels in the 60 to 70 dB range. 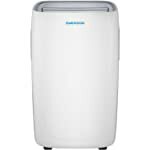 The best quiet portable air conditioners that we’ve listed in this article is in the 50 to 60 dB range, which is much quieter than normal. Bellow is an illustration of decibels against common sounds that most people are familiar with to try to help you understand the decibel scale and determine how quiet your portable air conditioner is. Any sound above 85 dB can cause hearing loss, and the loss is related both to the power of the sound as well as the length of exposure. You know that you are listening to an 85-dB sound if you have to raise your voice to be heard by somebody else. Eight hours of 90-dB sound can cause damage to your ears; any exposure to 140-dB sound causes immediate damage (and causes actual pain). Sounds in the 60 to 85 dB range can be harmful if a continuous noise affects the quality of life and stress levels of those exposed to it. Sounds in the 50 to 60 dB from quiet portable air conditioners can be considered a white noise – which might help you sleep better. But many people don’t like this kind of sound. 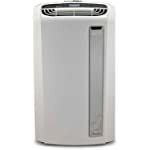 If you’re shopping a portable air conditioner for your bedroom, the Whynter ARC-122DS Elite is the best choice. At only 51.5 dB on the highest fan speed, this unit is so quiet that you should be able to sleep easier all summer. Not only is it quiet, it cools a room much faster than other portable air conditioners of the same capacity, using the least energy, even in extreme heat. It’s also significantly smaller and lighter than its closest competitors, so you can move it from room to room with ease. The Whynter ARC-122DS Elite portable AC is equipped with a Self-Evaporative system which exhausts most or all condensate under average ambient conditions. It also comes with an internal condensate AutoPump that can be activated to pump out excess condensate that may accumulate in high humidity conditions. It uses none ozone-depleting R410A refrigerant and is made with all RoHS compliant components that are free of toxic chemicals, designed to be an environmentally friendlier product. A key feature of the Whynter ARC-122DS Elite is its compact size and dual-hose system which facilitates better space utilization and more efficient cooling. A dual-hose system provides for greater air intake and constant air pressure which enables its 12,000 BTUs of power to cool at a faster rate than comparable single hose systems. It also comes equipped with a 24-hour programmable timer, allowing you to save energy by setting your unit to cycle on and off automatically. You can even program it to cool your space before you arrive or set it to turn off after you leave. Overall, we pick the Whynter ARC-122DS Elite for the first spot not only as it’s one of the quietest portable air conditioners that won’t bother you at night. Its superior compact design, portability, and myriad programmable features make it the perfect companion in almost any indoor location including data closets, server rooms, bedrooms, classrooms, and garages or shops. And because its energy efficiency rating (EER) is so high, up to 12.25, it doesn’t radiate as much heat from its body back into the room. So it should cool rooms quickly and reach lower temperatures than less-efficient models—both of which can have a big impact on your comfort in very hot, humid weather. 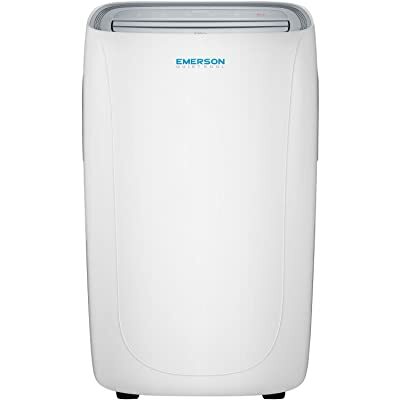 If our main pick is unavailable, the Emerson Quiet Kool EAPC14RD1 is another great portable air conditioner to buy. This portable AC unit is quiet, portable, powerful, energy efficient, and not too pricey, either. It gets so many positive reviews from users and at this time it’s one of the top-rated portable air conditioners on Amazon and other sites. It comes with a great warranty: 1-year labor, 2 years parts and 5 years compressor. At 54 dB on the highest setting, this is not the quietest portable air conditioner for you, but it’s definitely a very low noise portable AC unit. The Emerson Quiet Kool EAPC14RD1 is actually quieter than most 14,000 BTU portable air conditioners on the market. And its 8,000 BTU counterpart, the Emerson Quiet Kool EAPC8RD1, is even quieter, which produces only 52 dB on the highest fan speed. This would be a perfect option if you have a small bedroom. Using auto evaporation technology, this unit also functions as a dehumidifier that removes 4.4 pints of moisture from the air per hour. Easily cooling a room up to 320 sq. ft., convenient features include a remote control, 24-hour on/off timer, and sleep mode. 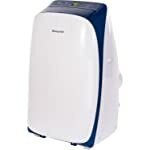 If you’re looking for a powerful portable air conditioner for your large bedroom or living room and don’t mind paying a little extra, look no further than the De’Longhi Pinguino PACAN140HPEWC WhisperCool. 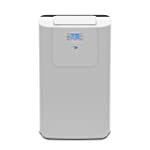 It’s the quietest 14,000 BTU portable air conditioner in this list and we think it might be very difficult for you to find any other 14,000 BTU unit that is quieter than it. At only 53 dB on the highest setting, it’s only a little bit louder than our main pick, the difference between the two is very small. 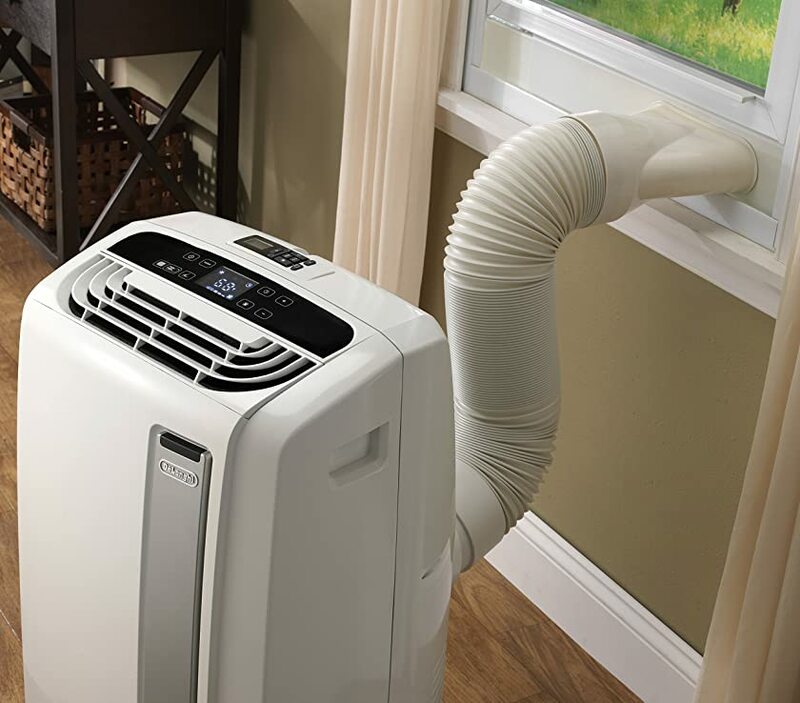 This quiet portable AC unit has a maximum cooling capacity of 14,000 BTU/hour with a 4,105-Watt heating power can be up and running in any room with a window in as little as 5 minutes. 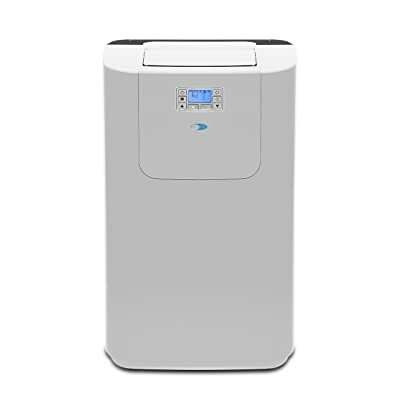 Perfect for rooms up to 500 square feet, this unit also comes with a dehumidifying and fan function to optimize the balance between temperature and humidity. This machine features DeLonghi’s patented dripless exhaust technology. During cooling and dehumidification, collected condensation is automatically evaporated through the included exhaust hose. This means that under normal conditions, you’ll never have to empty a water bucket — thing only a few portable ACs can do. It can also trap bacteria, dust and pollen as it prevents the growth of mold and mildew. The Pinguino PACAN140HPEWC WhisperCool is designed for use in double-hung and vertical sliding windows as wide as 38 inches, the included window bracket quickly locks into place with no tools required. Attach the exhaust hose, plug the air conditioner into a standard 115-volt electric socket, and within minutes, you’ll experience an enhanced level of comfort. If you’re looking for a quiet portable air conditioner unit for a small bedroom, treat yourself to the Honeywell HL Series HL10CESWW, a 10,000 BTU single-hose unit. It is not as powerful as other units, but it’s extremely quiet, you can barely hear its sound from 10 feet away when it’s in the sleep mode. More importantly, this unit has a very affordable price, it’s much cheaper than 3 models above. So this would be a great option for those who don’t want to spend much money for a portable AC. Operating at only 52 dB, it’s hard to realize the HL Series HL10CESWW delivers 880W of powerful cooling at 241 CFM. 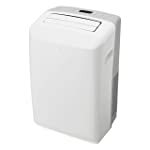 It combines 3-in-1 technology into one luscious and sleek body, cooling and dehumidifying areas up to 350 sq. ft. It features an auto-evaporation system, a dehumidifying function which can remove around 80 pints of moisture per day, as well as a traditional 3-speed fan. It comes with all the accessories you need for quick and easy installation. The adjustable window bracket can accommodate double-hung or sliding windows from 26.6 to 49.6 inches while a 4-foot long vent hose and 6-foot power cord allow for optimum placement in your room. Overall, you’ll like the Honeywell HL Series HL10CESWW if running quietly is your priority. This is also a great alternative to RV air conditioner, in case you have an RV, since this unit uses just about 880W maximum. A single-hose design at 12,000 BTUs, the Frigidaire FFPA1222T1 Gray is suitable for most medium-sized residential spaces such as bedrooms and living rooms. This unit doesn’t have the quietest operation, but at 53.6 dB on the highest fan speed, it’s still quieter than 90 percent of the portable air conditioners on the market. Even though it’s less efficient than our top pick, the Whynter ARC-122DS Elite, Frigidaire claims that it’s capable of cooling spaces up to 550 sq.ft. This portable AC unit engineered for portability and equipped with casters, to move it to another room easily for extended use. With the auto-swing louvers, you will receive more even air distribution as the louvers automatically circulate cool air throughout the room. Effortless temperature control maintains the preset temperature so you will remain comfortable. Plus, effortless restart automatically resumes operating at its previous settings when power is restored to your unit after a power outage. For those hot nights that lead to cooler mornings, this AC has a convenient sleep mode, which will gradually increase the temperature as you sleep the night away. 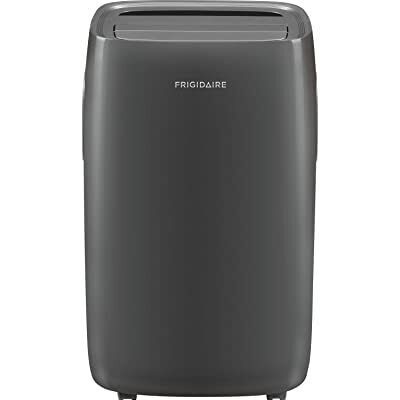 Overall, we suggest the FFPA1222T1 to you not only as it’s one of the quietest portable air conditioners on the market today, it comes from Frigidaire – which is one of the leading suppliers of quality home appliances. When you select a portable AC unit from Frigidaire, you’ve chosen a product of exceptional performance, convenience and style. The Whynter ARC-12S is known for its exceptionally quiet operation when compared to similar-sized portable ACs. At its highest fan speed, it emits only 52.5 decibels of sound, which is 1 dB louder than our top pick, the Whynter ARC-122DS. Both are the quietest portable air conditioners that Whynter offers to its customers. And both are 12,000 BTU which is very efficient in cooling spaces of 400 sq.ft or less. For the ultimate in convenience, the Whynter ARC-12S features Whynter’s patented auto-draining condensate technology. This system automatically exhausts all collected condensate outdoors in most environments. The auto-draining system also uses moisture collected during the air intake process in order to cool outgoing air, which boosts the portable AC’s efficiency. In certain environments, the ambient humidity level may result in some moisture collecting in the ARC-12S’ condensate tank. To protect your environment in the event of a condensate overflow, this unit features a tank full indicator that automatically stops AC operation until you can manually empty the tank. The Whynter ARC-12S is not only known as one of the quietest portable ACs on the market, it’s also known as one of the most energy-efficient models, with an 11.4 energy efficiency ratio (EER). 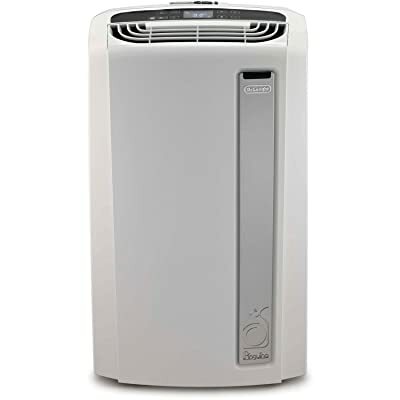 Typically, portable air conditioners with EERs over 10 are considered energy efficient and cost-effective cooling options. As part of a new generation of green cooling alternatives, this unit is also constructed with numerous eco-conscious features. So this is a great eco-friendly solution for cooling bedrooms, offices, classrooms, garages, workshops, and computer rooms. 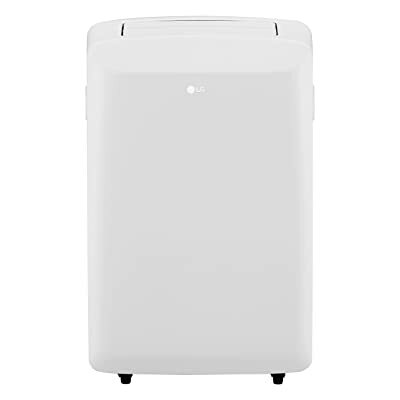 If you need a quiet portable air conditioner for small rooms like offices or bedrooms, don’t forget to consider the LG LP0817WSR 8,000 BTU Portable AC. This unit is not as powerful as the options above, but when using in a small room that less than 200 sq.ft, it cools the room very fast, and very efficient. Operating at only 53 dB, it’s quieter than most other 8,000 BTU portable ACs that we’ve known. As far as we know, the LP0817WSR, along with the Whynter ARC-14S, is one of the best-selling portable air conditioners of the year every year. In addition to cooling your space, the LP0817WSR can also dehumidify-pulling a maximum 1.8 kg kilograms of moisture from your space per hour. It features Automatic Restart, which allows the unit to resume operation with your last input settings in the event of a power outage. The included installation kit will easily accommodate most vertical-sliding windows from 18″ to 50″ wide, as well as casement-style windows from 18″ to 50″ high. What’s the best air conditioner for casement/sliding windows? If you buy a quiet portable air conditioner that’s not built to do the job you need it to, you can count on disappointment. You need to find a product that will work in the space you have available, at a cost you can manage, while meeting all your main needs. Here are several important factors that you should consider before you make a purchase. The right portable air conditioner helps you cool a room efficiently. An undersized unit won’t cool adequately while one that’s too large will not remove enough humidity, leaving the air feeling damp. To find the proper air conditioner, determine the square footage of the room you want to cool by multiplying the room length by its width. You also need to know the air conditioner’s BTU (British Thermal Unit) rating, which indicates the amount of heat it can remove from a room. For rooms with excessive sunlight, select a unit with 10% more BTU’s than what is required by the size of the room. If placing a unit in the kitchen, select a unit with an additional 4,000 BTU than what is required by the size of the room. When choosing the best quiet portable air conditioner for your needs, you will likely notice that there are two types of hose configurations to choose from — a single hose or dual hose. The single hose portable air conditioner pulls warm air from the room, sends it past coils cooled by the refrigerant, and then sends heated air and moisture through the hose and out of the house. This can create “negative air pressure” because air is constantly being pushed out of the room. The result is that any cracks around doors and windows will allow hot outside air to leak into the room, and will actually pull that hot air into the home. If the room being cooled is very big, the single-hose system will have to work harder and harder to cool the room. On the other hand, if the room isn’t big, then the single hose system can provide sufficiently cooled air without costing too much. In addition, single-hose units are usually quieter than dual-hose units of the same BTU rating. Most dual-hose portable air conditioners use two internal fans/compressors, which result in higher sound output. Most of the quiet portable air conditioners in our list are single-hosed. The dual-hose portable air conditioner has a couple of intakes and one outtake hose. Through the intake, air is drawn into the unit where it is cooled and then sent back into the area. The machine heats up through the process and an intake hose pulls air from outside the home to cool the air conditioner down. A second hose sends all of the warmed air outside of the home. As such, a dual-hose portable AC does not create the negative pressure inside the room being cooled like single hose models, and it may be more efficient than a single-hose portable ACs since the AC doesn’t have to work as hard during the cooling process. Not only more efficient, this type of portable air conditioner can cool your room approximately 40% quicker than single-hose designs. Though dual hose units may tend to be more expensive and more energy usage. They are also noisier and less portable than single-hose units. What type of drainage is required? Most portable AC units will have a self-evaporating system, so the water condensation is recycled back into the air, so no drainage is required. You most likely never have to dump the collected water, except in areas with extremely high humidity. Under that circumstances, the collection bucket may need to be emptied manually, but the compressor will automatically shut off and an indicator light will inform you to empty the tank. In portable AC units with a condensate pump, water collects in a tank and pumped outside through a hose. Additional installation is required though. Some models will require you to manually empty the water collection tank. This will need to be done every 2 to 6 hours depending on the humidity levels in the room. A portable air conditioner’s efficiency is measured by the energy efficiency ratio (EER). The EER is the ratio of the cooling capacity (in British thermal units [Btu] per hour) to the power input (in watts). The higher the EER rating, the more efficient the portable air conditioner. Typically, portable air conditioners with EERs over 10 are considered energy efficient and cost-effective cooling options. You can expect to save money on your electric bill if you choose a machine with higher EER ratings. Among the best quiet portable AC units we reviewed, the Whynter ARC-122DS has the highest EER rating, up to 12.25 while the average rating is less than 10. A programmable thermostat lets you set the air conditioner for the precise temperature you want and trust that it will turn off once the room’s cooled to that point. This not only eliminates the need to manually turn it on and off, but you can oftentimes pre-program the unit to start cooling at specific times. An air conditioner that comes with a dehumidifier can help remove dampness from the air. Controlling the humidity in your home is beneficial for many reasons, but is especially important as the heat starts to rise. An air conditioner that doubles as a heater will save you the trouble of having to purchase a separate product for heating your home in the winter. This feature will give you more bang for your buck, as you can use it year-round. A remote control gives you power over the air conditioner from a distance, so you can turn it on and off without getting off the couch or climbing out of bed.